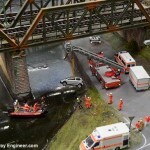 Rivers, streams, lakes and seas are something every model railway builder wants but notoriously difficult to get right. Until now. 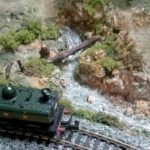 Here’s a simple, easy and foolproof way to create beautiful waterways and waves for your layout. 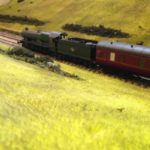 A natural looking river, lake or coastline can make a huge difference to a model railway. 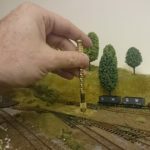 Done well they add an extra dimension to a layout. 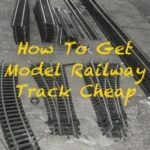 Unfortunately, they’re rarely done right and all too often end up wrecking an otherwise nice model railway. But by chance I came across this video. It reveals in a simple manner how to create incredibly authentic looking waves and waterways. I use wood glue and varnish for my water but I usually only model slow moving or still waters. The technique uses the same material – plus a mystery extra which I’ll Martin reveal – but can also be used to create waves and ripples. It’s a blinding obviously technique when you think about it but is one I and others I’ve spoken to hadn’t thought considered. Watch it and let me know what you think. There’s also this technique which creates more dramatic but equally good waves. You can get the gel Troels Kirk uses here. Finally, for suggestions on modelling other types of water, see this handy guide. What an excellent tutorial video – only watched the first one so far. Informative, down to earth ( well, water) and amusing too. What is the best way of painting rock face. 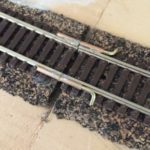 I’ve been building my model railway for 9 months now and I’ve built all my tunnels and a quarry, the undercoating has been applied to all the rock faces and now I’m ready for the finishing touch but I haven’t got a clue. HELP! Hi Stephen, the best way is to get photographs of rock faces you want to emulate and experiment, blending different colours and achieve the desired effect. I’d start with a dark colour wash (which will fill the cracks where there would be shadows) and apply lighter matte colours – greys, reds, yellows and browns – to match the desired rock formation colours. Finish with a light colour dry brushing to accentuate edges. Don’t forget plant growth too. Painting rocks and rivers is more art than skill so don’t worry if it takes a few goes to get it right (I’d practice first). Use Google image search to find pictures of rock faces, experiment and above all have fun. (eg: a fast flowing stream or waterfall) either of these two techniques described here would seem to fit the bill.